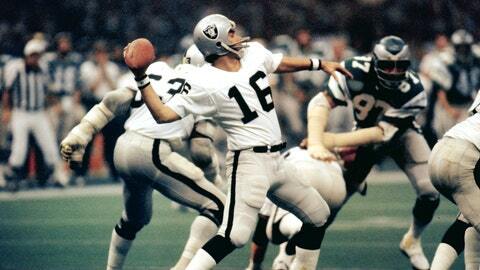 Oakland Raiders quarterback Jim Plunkett was named MVP after a 27-10 victory over the Philadelphia Eagles in Super Bowl XV. As we count down to Super Bowl 50 in Santa Clara, it’s time to look back on the magical and memorable moments in the 49 previous Super Bowls. 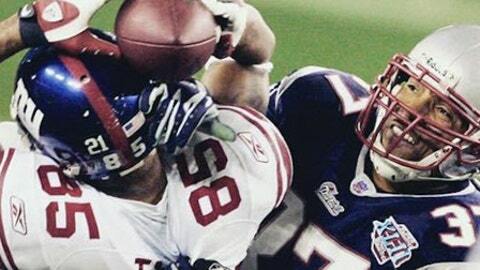 FOX Sports senior NFL writer Alex Marvez has ranked the 50 greatest moments in the big game’s big history, and every weekday from now until Feb. 7 we’ll unveil the latest addition to our countdown. Today, we look back at moment No. 43 when the Raiders burned the Eagles in the Bayou in Super Bowl XV. Oakland Raiders running back Arthur Whittington (No. 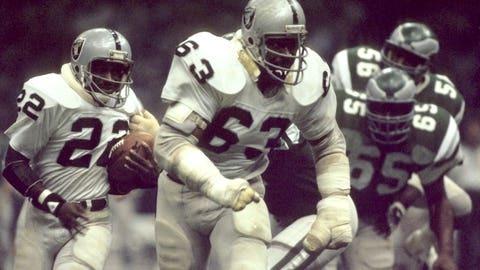 22) follows Raiders Hall of Fame guard Gene Upshaw (No. 63).